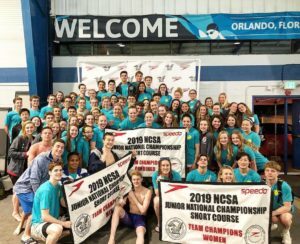 The final day of the 2019 NCSA Spring Junior National Championships featured finals of the 50 back, 1650 free, 200 IM, 50 free, and 400 medley relays. Kicking off the evening was the 3rd and final backstroke showdown between Phoebe Bacon and Isabelle Stadden in the 50 yard race. 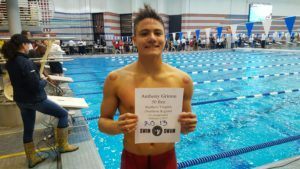 After Stadden won both the 100 and the 200 races over the meet, Bacon emerged victorious in the 50 back this time around. Walking away with a distance free sweep was NCAP’s Paige McKenna, who tore up the 1650 free and swimming a top-10 time in the 15-16 age group. 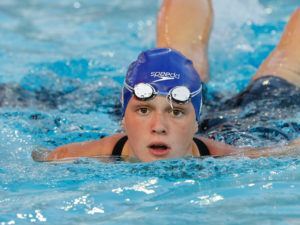 Previously, McKenna won the 500 and 1000 free events. Joining McKenna for a stroke-sweep was Grace Sheble, securing her IM-sweep with her 200 IM victory. But it was 16-year-old Torri Huske that clinched her fifth meet victory today with her dominant 50 free performance. Along with the 50 free, Huske collectively won the 100 IM, 100 free, 200 free, and 50 fly this weekend. Each of the top three finishers knocked serious time off their prelims marks, but finished in the exact same order as this morning. Phoebe Bacon once again led the way, improving from 24.69 this morning to 24.38 tonight. Aquajets teammates Isabelle Stadden and Abigail Kapeller rounded out the top three with times of 24.53 and 24.81. 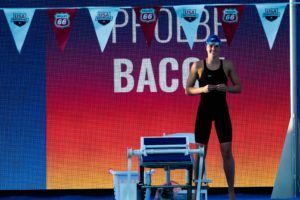 To give you a little perspective on those times, Bacon’s time tonight would’ve equaled or been better than five of the sixteen 200 medley relay leadoffs from last night’s women’s NCAA Division I championships. Aidan Stoffle pulled a minor upset here, winning from lane five in 21.65 after swimming 22.45 this morning. Stoffle rocketed out to the lead, flipped first, and held off the field to win by over four-tenths of a second. The Auburn commit has had quite the improvement curve in this event — he was 22.99 at this meet last year, and had a personal best of 22.40 coming into today. His time tonight was just 0.04s off the 200 medley relay leadoff Auburn got last month at the SEC Championships, meaning that Stoffle could very easily find himself contributing to the Tigers’ relays as a freshman. Jack Dolan improved on his top-seeded 22.31 from this morning, taking 2nd in 22.07. Wesley Jekel also cut some time from his prelims swim, taking 3rd in 22.38 after going 22.54 this morning to qualify third. Nation’s Capital’s Paige McKenna completed her sweep of the distance event this meet, taking the 1650 in 15:55.72 to go along with her wins in the 500 and 1000 earlier this week. While that’s a bit off her best time of 14:48.07, it would still rank her #9 all-time in the 15-16 age group, and would be good enough to score points at NCAAs. McKenna currently ranks 7th all-time in the age group. Suburban Seahawks’ Madison Kolessar dropped 4.5s off her seed time to take 2nd in 16:18.95, while Rachel Stege got her third top three finish with a 16:27.12 effort. 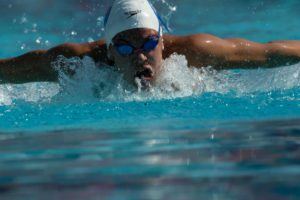 She’d placed 2nd behind McKenna in the 1000 and the 500 free. 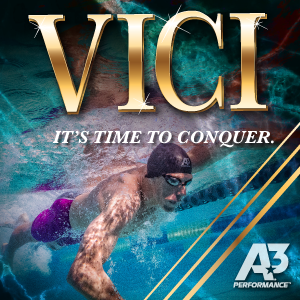 One of the great things about watching an IM is that the lead can change constantly, and that’s exactly what we got here. 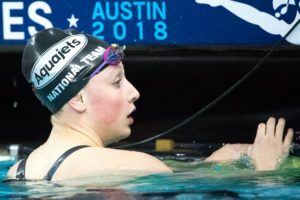 After a few lead changes, four women turned nearly-simultaneously heading into the final lap, but it was Grace Sheble who powered home to win by over half a second, touching in 1:57.00. Right behind her was Phoebe Bacon, who got her second top-two finish of the night with a 1:57.62. 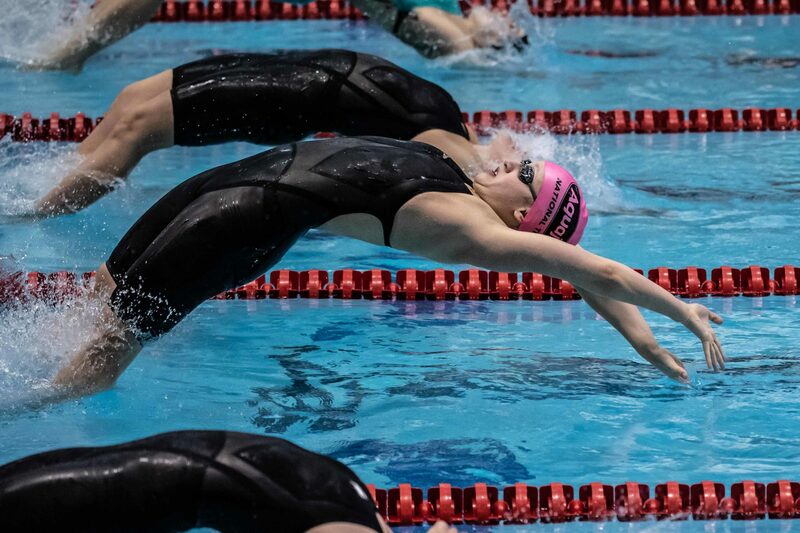 While everyone’s attention may have been on the middle of the pool, Felicia Pasadyn in lane one actually turned with lanes 4-6 heading into the freestyle leg, and she hung on for 3rd in 1:58.31. Shane Blinkman took control on the breaststroke leg and didn’t let up as he took the win in 1:45.77. 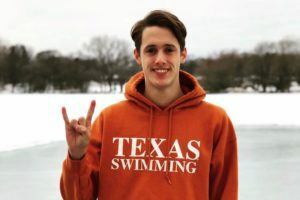 Sean Conway was in the lead at the halfway point, and while he couldn’t match Blinkman’s breaststroke leg, he had enough left in the tank to take 2nd in 1:46.13. Jason Louser‘s been on a few podiums this week, and he took 3rd in 1:47.64. Tori Huske is already #2 all-time in the 15-16 age group, and while she was 0.41s off her best time (21.95), she was fast enough to win tonight even off a bit off her best. She took the win in 22.36, holding off Talia Bates, who knocked a tenth of a second off of her time from this morning to take 2nd in 22.42. With only a few hundredths of a second separating the next few places, it was Carly Noveline who got her hand on the wall from lane one to take 3rd in 22.57. Topher Stensby held on to his top seed from this morning, winning the 50 free by a wide relatively margin, touching in 19.77 as the only man under 20 seconds. That was just 0.01s Stensby’s best time coming into the meet, and he could provide an immediate boost to the Notre Dame sprint corps when he arrives on campus this fall. Jack Dolan and Aidan Stoffle both earned their second top-3 finishes of the evening, taking 2nd and 3rd here in 20.09 and 20.23 after swimming the 50 back earlier this session. Each of the top three finishers took pretty big chunks out of their seed times in order to make the podium. 16 year-old Samuel Oliver led the way, getting his first victory of the meet and taking 5.18 off of his seed time to win in 15:12.66. Cole Kuster and Aidan Regan were in two different heats, but ended up within half a second of each other. Kuster dropped just over 12 seconds off his seed time to take 2nd overall in 15:22.47, while Reagan improved by a whopping 23.84 seconds to take 3rd in 15:22.92. NCAP won by over two seconds, thanks to particularly strong splits by Phoebe Bacon on back (51.46) and Abby Harter on fly (52.78). Bacon’s time was about a tenth faster than her time last night in the individual 100, when she took 2nd to Isabelle Stadden. Elmbrook took 2nd, with Reilly Tiltmann providing the standout leg, a 48.71 anchor leg. 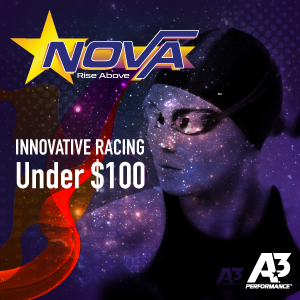 200 IM champion Grace Sheble split 1:01.38 on the breaststroke leg to propel NOVA to a 3rd-place time of 3:38.66. 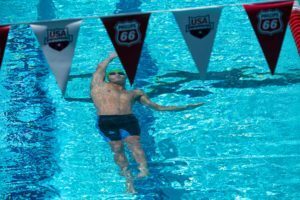 The final heat of of the boys 400 medley relay featured a tight three-way battle, with the top three times all coming out of that heat and finishing within 0.56s of each other. The Aquajets got a 48.97 leadoff by Anderson Breazeale that helped keep them in the lead through the first half of the race, but St. Charles and Long Island got sub-54 breast splits by William Myhre and Jason Louser to keep it close. St. Charles charged ahead on the back half and took the win in 3:17.39, with Long Island and the Aquajets just behind at 3:17.77 and 3:17.95. Why are half of day 2 final events not there? where did Anthony Grimm go?